Disclaimer: This is first article from the new author here the Approach North, Liisa K! 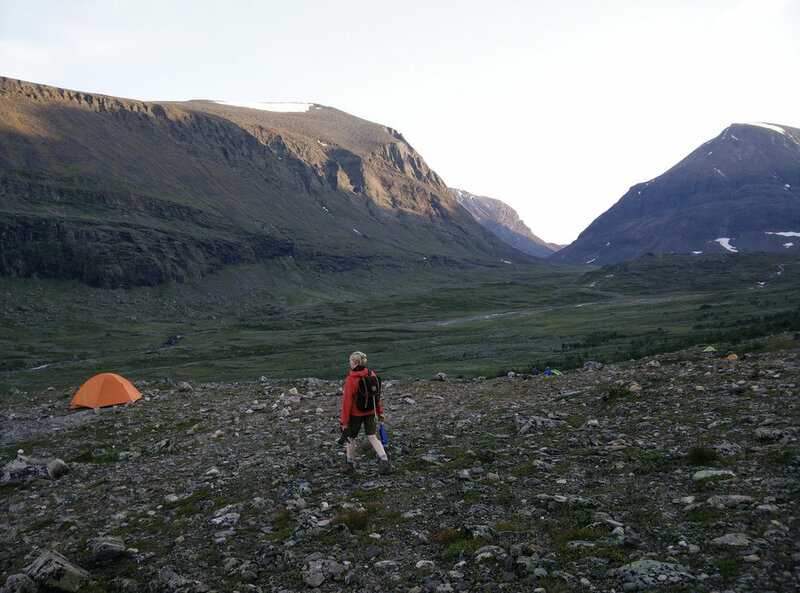 This article is about our first longer hiking trip to Kebnekaise in July 2014. Pekka had been talking about Kebnekaise for several months. About how great it would be to hike to the highest point of Sweden. He’d been into mountaineering for some time and wanted to conquer Kebnekaise. I have always loved to explore nature, but I have not much experience on hiking. I have been couple of times in Finnish Lapland in the summer time and hiked there daytrips. My mountaineering experience was limited to Saana fell, the second highest point of Finland, only 1029 moh. In July 2014 we made a road trip through Finland to Finnish Lapland, northern Norway and Sweden, and during that trip we ended up to the top of Kebnekaise too. We started our Kebnekaise exploration in Kiruna. Kiruna is a mining town in northern Sweden in the middle of fjells and the nearest biggest town of Kebnekaise. The town is known for re-development aka moving the town out of the way of the mine. We drove to Kiruna from northern Norway and found a lunch place near the center. After the not so good Swedish meatballs we headed to Nikkaluokta, about 70 km west from Kiruna. 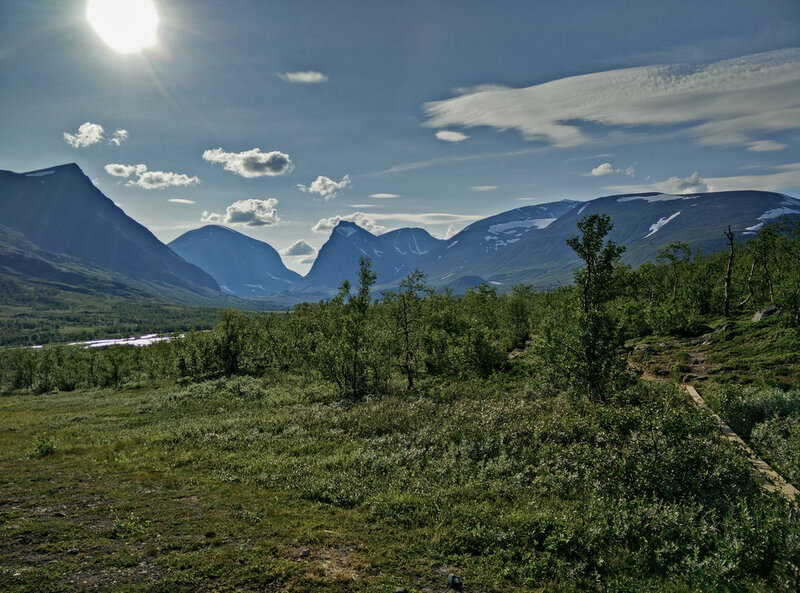 We arrived to Nikkaluokta and the starting point of the hike to the Kebnekaise mountain lodge. There was only about an hour to the departure of the boat which we had decided to take. And to get to the pier we should hike about 5 km. At the parking lot Pekka was a bit unsure whether we should go to the hike or not. Because I had been hearing many months about Kebnekaise hike and didn’t want to hear it no more, I just said: “We’re gonna go now.” So we took our backpacks and headed to the hiking route. It was a good idea to shorten the hike by taking the boat. The boat trip shortens the hike with about 6 km. The weather was quite warm, about +25 degrees and the backpack felt heavy. Altogether the actual hike was about 12 km, and took about four hours. The terrain was nice with some slopes. There were quite many people hiking to the direction of the mountain lodge. It was the peak season. During the hike we saw families with young children and also elderly people going also to the mountain lodge. I thought in my mind that if they could do the hike to the top, so could I. The mountain lodge located in a beautiful place. We arrived to the mountain lodge in the evening and put up our tent. We went to bed after eating and set alarm to wake us early in the next morning. After a quite goodnight sleep (I woke only couple times to sheep’s baeing) I opened the window in our tent and saw the most beautiful scenery. What a place to wake up! We ate breakfast, packed our smaller backpacks and started the hike. Quite many people were hiking the route at the same day, but it was nice that the route was not extremely crowded. At first the hike route was quite moderately ascending, and after couple hours of walking we reached the Kettle valley, which was a beautiful kettle shaped valley surrounded by large mountains and a waterfall. The sun was shining and the weather was more than +20 degrees. There was a quite small river running trough the valley, it was easy the cross the river with dry feet. We continued and the route became more and more ascending and there were lots of loose big rocks. After couple hours of walking we reached the top of Vierramvare, which is almost as high as Kebnekaise and located next to Kebnekaise. From Vierramvare to Kebnekaise you have to descent to a huge valley. At this point I really thought of going back to the starting point because it felt very frustrating to hike up and down and then once again up to Kebnekaise. And the same have to be done of course on the way back! But we felt quite OK so we decided continue. After the valley started the hike to the top of Kebnekaise. The route was full of loose rock and I felt tired, but I kept going on because I wanted to reach the top. Quite many times I thought that the top was there to be seen, but the route just kept going on and on. After 6 or 7 hours of hiking we saw the icy top of Kebnekaise. At last it was there! It was an amazing feeling, we had reached the top of the mountain! The scenery was unbelievable, so many mountain and fjell tops could be seen from the top of Kebnekaise. We did not spend much time at the top because we knew that we had a long way back to mountain lodge and to our tent. We took photos at the top, ate some snacks and then started the journey back. My legs felt sour, especially my knees when descending. At the valley between Kebnekaise and Vierramvare we filled out water bottles with icy fjell water, which was extremely cold and refreshing. When we came to the Kettle valley, the sun was shining from another direction, and the valley was dark and seemed somehow hostile. Also the river which was small during the morning was now much more wider and deeper because the sun has melted the ice and snow of the mountains. While crossing the river I accidently dipped my feet and legs to the ice cold water. At this point I felt so tired, I wondered if I ever get back to tent. I started to cry and Pekka had to comfort and calm me down. I gathered some strength and we continued the hike. My legs were hurting but step by step we walked the way down. When we managed to see the mountain lodge, I started to feel a bit better because I knew I could reach the end. Pekka ran the last few kilometers so he could buy us couple beers before the mountain lodge closed down. I continued with my steady pace. And finally after 24 km and 12 hours of hiking I reached the mountain lodge and our tent. We ate some camping food and shared one beer, and it tasted so good even though it was a Swedish light beer. Then we went to sleep, and I didn’t have to wait long to fall asleep. Because my legs were very sour from the hiking to the top and back we decided to go back to Nikkaluokta with a helicopter. And that was a really good idea because I could not have been able to walk back with my backpack for couple of days. The helicopter ride was awesome, beside the fact that it was a very quick way to travel (only about 10 minutes)we managed to see the area from air. And the views were spectacular. Best 80 euros (per person) ever spent. When the helicopter landed to Nikkaluokta, we were so happy to see our car at the parking lot. It really was the best feeling ever to really realize that we had conquered Kebnekaise and we were back where we started this amazing, but painful trip. We actually did it! I was really happy that we went for the journey but at the same time I was even more than happy that the trip was over and we were both OK. The next time I would prepare myself better for a hiking trip. Better preparing in advance – Get enough info before hiking. About the route, level of difficulty compared to your skills and physical condition. Minimize the surprises. There are lots of people hiking the route. If you hike from Nikkaluokta to Kebnekaise mountain lodge, consider spending an extra preparation day at the mountain lodge before the hiking day to the top. Nutrition – Eat and drink properly before and during the hike. Take a proper meal and enough water with you to the hike. You will need the energy. It’s possible to fill water bottles during the hike, but remember to ask this beforehand at the mountain lodge. Helicopter ride – Consider taking the helicopter either one of the directions. The ride itself is an unforgettable experience. Gear – Hiking poles could be a really big help during the hike, and especially on the way back.